Lilla (seated, second right) with other RKS members in a photo-call after a press conference. She is flanked by Dr Philip (third right) and John. MIRI: The transformation of the Kelabit Community Museum in Bario into a digital-based facility should help the state achieve its ‘Digital Economy’ development target. The RM1.2-million museum – declared open by the state’s fifth chief minister, the late Datuk Patinggi Tan Sri Adenan Satem during the 10th Bario Nuneken Festival in 2015 – is touted as the first of its kind, set up as a platform to preserve the cultural heritage of the Kelabits. “Once the Kelabit Community Museum goes digital – with all its content available for access via online – we hope to have all the works done in Bario be gathered in a centralised, digital form. 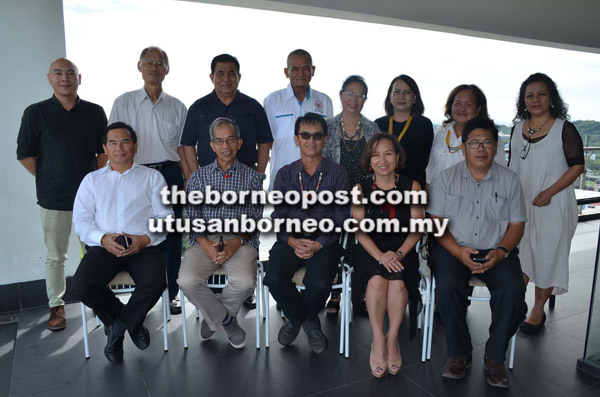 “Hopefully, all these things would also be able to be converted into an application – one that would highlight all the researches undertaken especially those on the flora and fauna, as well as the megalithic heritage of the Kelabit Highlands. This would indirectly help to market the Kelabit community as well,” said Rurum Kelabit Sarawak (RKS) publicity officer Lilla Raja, who is also the organising chairperson of Bario Nuneken Festival 2017, during a press conference here yesterday where RKS president Dr Philip Raja and Miri City Council Councillor John Trawe were also present. According to her, the Kelabit museum is an initiative by the RKS in partnership with Sarawak Museum Department, with Universiti Malaysia Sarawak (Unimas) being tasked with taking care of its physical content. “At the moment, it is not viable to relocate the artefacts, photos and other items related to the Kelabits from Sarawak Museum to Bario. So, the solution is to have a digital or virtual museum instead – where the artefacts are available for online viewing. Lilla said the repository could be the platform to store and preserve the traditional songs, poems and stories and even the language of the Kelabits. “It can be a one-stop centre for all things Kelabit – a knowledge hub for our children and future generations. Just imagine the possibilities – this can be the platform to design and develop a number of applications that our tourist guides, homestay operators and also farmers can use to improve their livelihood,” said Lilla, also expressing her gratitude to the experts from Sarawak Museum, Unimas and Curtin University Sarawak as well as academicians from international universities such as Cornell (US), Cambridge (UK) And Deakons (Australia), for their contributions. “We are excited that this (move to digital museum) is so timely – at a time when the Chief Minister Datuk Amar Abang Johari Tun Openg is stressing about the importance of ‘Digital Economy’. We hope that especially for the rural areas, the necessary infrastructure would be put in place soon towards making this vision a reality,” she added. The soft launch of the proposed Kelabit Community Digital Museum will be performed by Deputy Chief Minister Datuk Amar Douglas Uggah Embas on July 27 – the start of the three-day Bario Nukenen Festival 2017, organised by Bario Women and Youth Committees, and supported by RKS. At the festival, visitors get to know more and be aware of Bario’s unique food such as its famous rice, spring salt and highland pineapples, as well as its ‘jungle supermarket’ that offers various produce such as wild ferns, shoots, fruits, fish and meat. Apart from the soft launch of the digital museum and an exhibition on the Kelabit megaliths, there will also be a briefing on the highland development plan by Deputy State Secretary Datuk Ose Murang. This year, residents of 20 villages from around the highland, including a Penan village, are set to take part in the festival and showcase their signature offerings to visitors. Moreover, they will also vie for the ‘Best Stall Award’. Lilla said the response for festival this year had been ‘overwhelming’. “All scheduled flights including six chartered flights slated for the dates of the festival are fully booked. “Between 50 and 60 local 4×4 clubs are planning a convoy (from Miri) to Bario – a journey that would take about 10 hours via timber roads. We are also expecting about 1,000 visitors this time, so our homestays would be fully occupied. Some people are staying in some of the longhouses,” she added. Miri Mayor Adam Yii has been invited to the festival, where he is expected to help the organisers with the ‘Ngebata and Ngeribed Bario’ – the ‘Greening and Beautification of Bario’. Deputy Domestic Trade, Cooperatives and Consumerism Minister Datuk Henry Sum Agong, who is Lawas MP, is expected to officiate at the closing of the festival on July 29.